The Bar itself is only 11 prims and the marching Bar Wall is only 12 prims. They come with all the features you expect from Khargo furniture like texture change and pose change - there are some interesting poses included on the bar :) It also comes with a bar tender pose to clean up all those spills - I spied you dancing there, Suzie!. 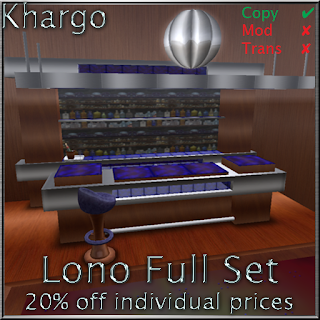 Also included in the set is a copyable barstool, a drinks dispenser and a resizable dance floor with dance ball. 2. barwall, 12 prims, copy - texture, tint, brightness, shininess and glow changeable in 2 groups. 3. dancefloor, 3 prims, copy/mod so you can change the size) - texture, tint, brightness, shininess and glow changeable in 2 groups. 5. barstool, 6 prims, copy -texture, tint, brightness, shininess and glow changeable in 2 groups - 1 spot for single sit with 5 different animated poses. 6. drink dispenser, 5 prims, copy - Touch the dispenser and a menu will pop up to choose a drink from, which is guaranteed to get you drunk before you're even 1/3 of the way through the list!